It’s fine to contact UoR Library staff during staffed service hours, but what can you do out-of-staffed-hours overnight, or when the Library Building is closed (such as during the University Easter Closure 12-17 April)? 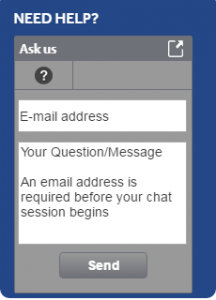 From today, you chat online via the blue ‘Virtual Enquiry Service’ box appearing on the Library webpage at these times! This service is staffed by professional librarians working remotely to answer your queries from our website and other information we’ve supplied. You can keep an email transcript of the chat. If they can’t resolve a particular issue they’ll refer you back to us during staffed hours. UoR Library has subscribed to this service in the third tranche of UK higher education libraries to join under a SCONUL agreement with OCLC. This entry was posted in General news, Opening hours, Staff, Vacation information. Bookmark the permalink.